There are a few recipes that mean Christmas to me, and this lemon loaf is one of them. The recipe originally comes from the wife of my dad's previous boss. She would bake little loaves for the whole office every year and I always looked forward to the day when my dad would bring it home. I honestly remember being sad when my dad left that job for bigger and better things because I thought it was the end of lemon loaf. (Ahhh, the things you think are important when you are growing up.) Luckily for me, my mom had asked for the recipe a few years earlier. 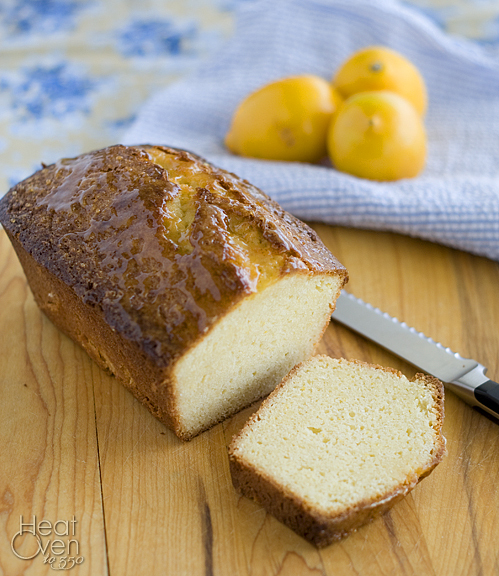 There is something about the lemony flavor and the rich, dense loaf that is perfect to me. It is just sweet enough with the right touch of lemon, and it has a rich, buttery taste and texture. 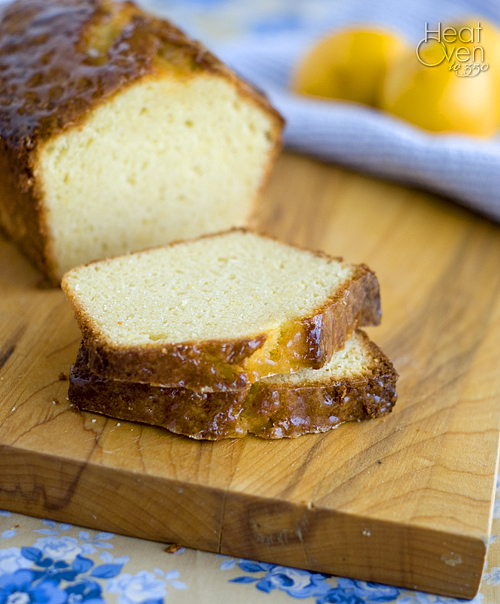 The lemon glaze on top adds a great punch of flavor that really makes the bread special. Heat oven to 350 degrees. From the lemon, grate 1 tablespoon peel and squeeze 4 1/2 teaspoons lemon juice; set aside. Grease a 9" by 5" loaf pan. In a large bowl, whisk flour, baking powder, salt and 1 1/2 cups sugar. With pastry blender or knives used scissor-fashion, cut in butter until mixture resembles coarse crumbs. Stir in peel. In a small bowl, whisk eggs slightly and stir in milk; stir this mixture into flour mixture just until flour is moistened. In 1 quart saucepan over medium-high heat, heat lemon juice and 2 tablespoons sugar to boiling. Cook, stirring, until slightly thickened, about 5 minutes. With pastry brush, brush sugar mixture evenly over top of bread. Serve warm, or cool loaf completely to serve later. Looks yummy! I have no memory of this loaf growing up... Did you eat it all before I got to have any? Yes, that is possible. :) I think you might have been young enough when dad left S&B that you don't have many memories of it. Mom had the recipe but it sat in her recipe box until I was whining one day about how much I missed the lemon bread we got every Christmas. LOOOVE lemony things! Oh goodness I wish I wasn't getting home so late or I'd make this loaf! I love lemon in baked goods! I'm definitely going to have to make this soon. I bet it would be really great if you used Meyer Lemons.